The very idea of the ESA Business Incubation Centre is conveyed in our favourite hashtag: #downtoearth. Start-ups are challenged to use space technology to solve a problem on earth. Johan Leijtens from alumnus Lens R&D did just that. And then he took his technology back #uptospace. The company Lens R&D, which celebrated its fifth birthday last year, develops “space-grade, off the shelf” sun sensors. This week, Lens’ brand new office and clean rooms were officially opened right across the street from the SBIC Building. Lens R&D was founded in 2012 by Johan Leijtens, based on many years of experience as a systems engineer developing sun sensors. His original idea for Lens was using space-grade sun sensors for large concentrated photovoltaic (CPV) installations. However, he could not completely give up his love for space, so in parallel he kept working on sensors for space applications. This turned out to have been a smart decision when the CPV market collapsed in 2015 as solar panels became much cheaper. At the same time, large orbital constellations such as the OneWeb project made the small satellite market boom. 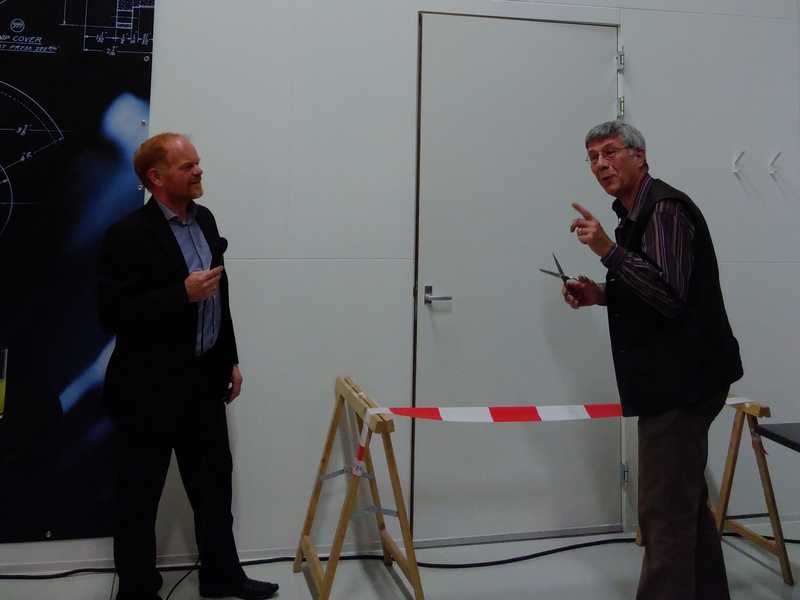 “Mr Sunsensor” Kees de Boom gives some sound advice to Johan Leijtens before cutting the ribbon to open the clean rooms. The newly constructed clean room similarly shows Lens’ stubbornly unique approach. A standard model clean room was unfeasible financially, so the Lens team built their own: the first wooden clean room in the Netherlands. Over the next couple of weeks, inspections will have to prove that this works just as well as a standard model clean room and that it meets all certification demands. Over the past couple of years, Lens R&D worked closely with ESA and NSO to produce fully qualified sun sensors. “But ESA only launches one satellite per year. Our real business case lies in mass production for private satellite builders,” Leijtens predicts.